If you have an Android phone or tablet, then you’re no doubt familiar with Google's powerful voice search. Now, the feature has arrived to your desktop and laptop, courtesy of the newly released Google Voice Search Hotword browser extension, currently available for download at the Chrome Web Store. Once installed, the Hotword add-on is quite simple to use. 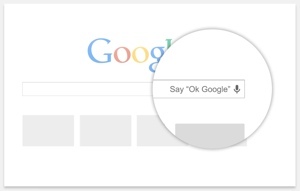 Simply navigate to Google.com and say “OK Google.” Your computer will then automatically activate its mic to await your question. The mic will automatically deactivate after 5 minutes to keep from eating away at your laptop battery. If you’d like to give Google Voice Search Hotword a try on your own computer, visit the app’s page on the Chrome Web Store using the Chrome browser. Click the blue “Free” button, and agree to give Google permission to access your mic. It’s that simple.